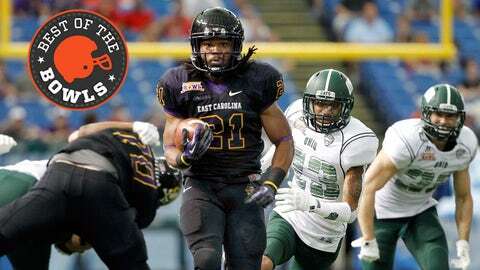 East Carolina's Vintavious Cooper was a star in the Beef 'O' Brady's Bowl. It’s simple holiday party etiquette: Accept the appetizer with a smile and slyly slip it to the family dog when nobody’s looking. That’s always the first choice. The last: laugh at the host and mock their food. See, Monday, the Beef ‘O’Brady’s Bowl was our host,and you’d have to be a particularly greedy character to complain about football on a Monday afternoon, no matter its form. Mock the Beef ‘O’ Brady’s Bowl if you wish, or the lifeless and dim den of Tropicana Field in which it is played, but East Carolina and Ohio graciously helped us wade through a few more of the final work hours before Christmas. So we sling no arrows here. My Marketing class had a higher attendance than this Beef O Bradys Bowl. Come on, that’s uncalled for. Put the bow away. The Internet is lacking holiday cheer, it seems. Wait – is there hope? Let’s follow her lead with five Beef ‘O’ Brady’s-related things we enjoyed while the rest of you procrastinators were shopping. 1) East Carolina won 10 games? East Carolina won 10 games! Cheers to Pirates coach Ruffin McNeil, as ECU beat Ohio 37-20 and gave its head coach the first bowl game of his career in his fourth season at East Carolina. It was the Pirates’ first postseason win since 2007, when they beat Boise State in the Hawaii Bowl. More impressively than a Beef ‘O’ Brady’s win, though, is a 10-3 record in ECU’s final season in Conference USA (it will join the American in 2014). It’s the first time since the 11-1 team in ’91 that ECU has won 10 or more games, and those would be the only two times ever that’s been accomplished in Greenville. Want one more piece of Pirates history? On their way to 10 wins, they beat both North Carolina and NC State in the same season for the first time in program history (49 years). The highlight of the game was ECU quarterback Shane Carden hauling in a fourth-quarter touchdown pass from receiver Cam Worthy. After throwing the ball out wide to Worthy, Carden streaked down the right side and made a terrific grab at the pylon, going up in between two Ohio defenders and pulling the throw out of traffic. Pretty good, pretty good. As good as The B.J. Raji? No, because nothing’s as good as The B.J. Raji. Cooper rushed for 198 yards and two touchdowns on 25 carries, earning the time-honored Beef ‘O’ Brady’s MVP award. His father, A.C. Cooper, is regarded, according to the ECU website, to be the best high school athlete to come out of Clinch County High School. Mr. Cooper was a three-sport star – football, basketball and baseball – and won six state championships while at Clinch. Here are Beef ‘O’ Brady highlights – Vintavious can be seen running 31 yards for a TD at the :55 mark.